January 15, 2011 - STAT MedEvac orders five more twin-engine helicopters, the order consist of three EC135 helicopters and two EC145 helicopters and is part of an ongoing strategy at STAT to continually upgrade its fleet with the latest aircraft and the newest technology. The aircraft are scheduled to be delivered in the first half of 2012. STAT MedEvac has been a Eurocopter customer since 1984 and it became the first air medical provider to operate the EC135 in the United States in 1997. ?We value the strong, ongoing relationship that we have developed with STAT MedEvac over more than two and a half decades,? stated Marc Paganini, President and CEO of American Eurocopter. ?As we have continued to incorporate advanced technology to lead the industry and meet the growing needs of our customers, STAT has continually upgraded its fleet with our aircraft and has established itself as a recognized leader in the air medical industry.? STAT MedEvac has a fleet of 21 aircraft that consists of 14 EC135s and seven EC145s. Throughout the development of the fleet, STAT has developed a strategic upgrade and long-term financial plan that allows it to invest in the newest aircraft and best technology. These new aircraft will be phased into the fleet and will help ensure that STAT has the helicopters and the tools to provide its essential services. ?As we upgrade our helicopters, we always thoroughly evaluate the aircraft available. We chose the EC135?s and the EC145?s from American Eurocopter. It comes down to product performance and support. They currently are the best products for our missions and the team at American Eurocopter works with us to help ensure that our aircraft are available to meet the needs of our crews and our customers,? said Doug Garretson, President and Chief Executive Officer of STAT MedEvac. Both the EC135 and the EC145 were designed to meet the unique requirements of operators in several industries. Because of their cabin size, flexibility, performance and reliability, the aircraft have become preferred helicopters in a variety of industries in the United States, particularly in the air medical services industry. The EC135 and the EC145 share similar characteristics and their common cockpit layouts and technology can add up to operational cost savings and increased training efficiency within an organization like STAT MedEvac. ?We have standardized on the EC135 and EC145 platforms because they are the products that best meet our needs and the additional efficiencies we have been able to establish,? explains Garretson. ?Using a common helicopter platform allows us to more effectively manage our fleet?s maintenance program. We are also able to cross-train all our pilots on both aircraft, which helps ensure maximum flexibility in scheduling and personnel availability.? STAT MedEvac was the first helicopter and HEMS FAA Part 135 air carrier to apply and be accepted into the FAA?s Aviation Safety Action Program. STAT?s fleet operates from 17 bases in Pennsylvania, Ohio, Maryland, and Washington, D.C. These regional bases link rural and community health resources with advanced tertiary care centers and provide quick access to advanced care. 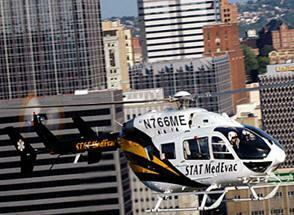 STAT MedEvac, a service of the Center for Emergency Medicine of Western Pennsylvania, Inc., is directed by a consortium of hospitals that include: UPMC Presbyterian Shadyside, Children?s Hospital of Pittsburgh of UPMC, and UPMC Mercy Hospital. American Eurocopter is a helicopter manufacturer that produces, markets, sells and supports the broadest range of civil and para-public helicopters offered by any manufacturer in the United States. The company is a subsidiary of EADS North America Holdings, the North American operations of EADS, a global leader in aerospace, defense and related services, and is an affiliate of Eurocopter, the largest helicopter manufacturer in the world.